“Rexton, NB” unceded Mi’kmaqi – On “Colombus Day”, a day which celebrates 521 years of genocide and oppression of Indigenous peoples, the Mi’kmaq Warrior Society has released the following video call for support. Suzane Patles, an Ilnu woman and member of the Mi’kmaq Warrior Society calls for physical support at the blockade, solidarity actions across Turtle Island on Oct. 18th and a flooding of Kanadian official representatives’ phone and mail lines. The October 18th Day of Action is a response in protest to the court injunction that SWN is looking to serve against the encampment. Organize an action in your community, use #INDIGENIZE and send us a write up with photos to post online: reclaimturtleisland [at] gmail [dot] com. The compound, where SWN has over hundreds of thousands of dollars in equipment, has been shut down and their equipment seized by local Indigenous peoples. 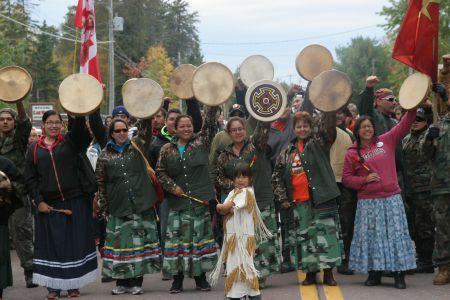 Patles is among many Wabanaki Confederacy peoples asserting their inherent and treaty rights and titles over their territories at an active road blockade since Sept 28th. The HWY 134 blockade is preventing SWN equipment from illegally excavating Mi’kmaq territory and conducting seismic testing in order to begin the process of hydraulic fracturing, or fracking, on unceded native lands. Produce all Bills of Sales, Sold, Ceded, Granted and Extinguished Lands for New Brunswick. Produce documents proving Cabot’s Doctrine of Discovery. Produce the Treaty of Peace and Friendship 1686. Produce Treaty of Fort Howe 1768. Produce consents for Loyalists to land in Nova Scotia/New Brunswick. Produce records of Townships created and consents by Chiefs to allow this. Produce agreements or consents by all New Brunswick Chiefs who agreed to Confereration of 1867. Produce evidence of consents to The Indian Act by all Native Tribes. Produce records of Trust Funds. Produce agreements for 4% of all mineral shares of finished products in Canada, except coal. Produce all correspondence letters pertaining to Numbered Treaties (Promises). Produce all documents creating border divisions, that divide the Wabanaki confederacy. Produce the Orders from the Lords of Trade to the Governor of the Colonies. The Mi’kmaq have never once succeeded any title of our lands, nor have we succeeded any of our rights to the lands in our territory. 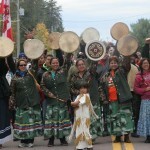 If the lands are not privately owned, and or are crown lands, or unoccupied lands, then reclaim them as our lands now! Assert Mi’kmaq Title to those lands now!! Our Treaties are based on friendship, not on succession of our lands nor our rights to self governance nor our identity of who as Mi’kmaq people. Their Doctrine of Discovery and Terra Nulius is a lie!! SWN is Southwestern Oil, a Texas oil company with projects throughout the Midwest and now entering the Atlantic market. I support your right to protect your land and to be reimbursed adequately/abundantly!! For those of us who live far enough away to go join in, boots on the ground, but are still outraged at what’s happening, please let us know who to contact to lodge complaints. Some of us are US citizens who want to contact those who “govern” in your area, just so they know this is more than just a local opposition.